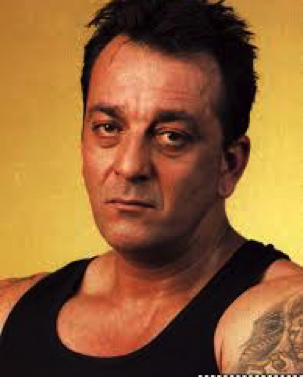 Sanjay Dutt is 56 today. He has been the quintessential Indian film hero and a poignant definition of a Bollywood super-star who has lived a dazzling life, but forever under a scanner. At times there have been those stories about his electric love affairs, snippets about his rebellious life and episodes of a clash of personality between his ever charming father, the late great Sunil Dutt and himself. In a life lived under tremendous limelight, the lanky lad has courted as many controversies as mega film successes. Coming from a tremendously successful family with proven acting genius, it has never been easy for Dutt to live peacefully for his life has been constantly measured against that of his father’s personality, an enigmatic family name and an acting lineage that has impacted Indian cinema beyond measure. While there was always a pressure to live up to the grandness of the great Sunil Dutt, there were never ending talks about Nargis Dutt: his mother, who lived a tumultuous but enigmatic life. And here we have Dutt standing beside a colossus of an acting career where he has charmed contemporary actors, romanced fellow actresses and become more than just a household name by playing an exceptionally diverse range of characters in a lifespan that has seen him don the hat of a villain, become a teen rebel, give nightmares as the dreaded gangster, romance his lady heart by being the mushy lover and has even been thee mad-hat doctor with a simple heart, and guess what, he isn’t done yet. If we are to argue that one who can take down multiple men in a fight or run faster than that sizzling sports car and frequently rescue the lady from the goons without bowing down, then, perhaps we are missing big time in defining the term macho. In the real sense, a macho man is a man who can be every bit emotional and sentimental as he is rock solid in his physical attributes and can take as many blows on to the body as he can to his mind and, despite facing an onslaught of despair and bodily blows, emerges stronger than ever and ready to face life once again. 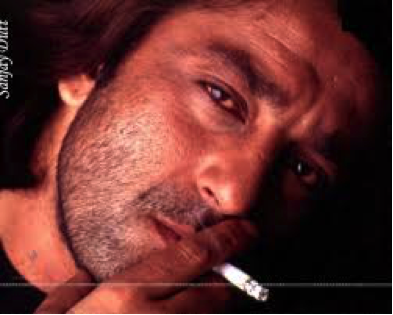 We won’t be doing injustice to the legendary Dutt if we are to examine his tormented and yet successful life from the rectitude of the above definition of macho. Amidst the litany of Hindi film failures and the false claims to successes, there are various other dampening facets to surviving the Indian film industry. Drug abuse, alcohol, women and a lust for power and attaining cult status figure in this unwanted list. 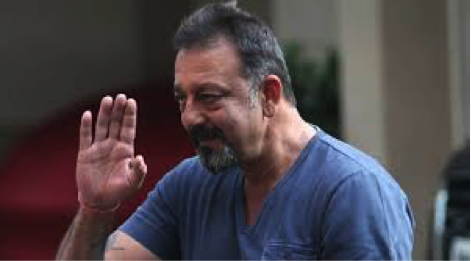 Dutt is no stranger to personal problems and confrontations and in a career that has spanned over 3 decades of astounding success, Sanjay has fallen, risen, then fallen again and is once again in the process of rising to his former glories. At an age where Dutt’s contemporaries are still busy building six pack abs and continue to dance around semi-naked, sometimes amidst the serenity of Switzerland and at times, striking pseudo Indian conscientious looks for what they call “art house or parallel cinema”, Dutt’s acting graph has matured from portraying the rebellious angst of the youngster on screen to playing a loving and caring father through his sensible on – screen portrayals. He isn’t the Rocky he was in the early 80s when he marked his highly successful on screen debut. 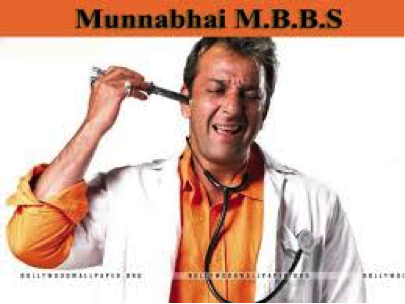 He is far from being the Khalnayak that he was way back in the early 90s, a role that won him as much critical acclaim as heart-felt ovations for his cult portrayal of Ballu Balram’s active resistance to anything marked with positivity and he has certainly aged beyond the Chal Mere Bhai days, where he played the elderly adorable brother to a flamboyant Salman. But, the grandeur of Dutt’s appeal remains intact through those bulging biceps that he willingly hides through the carefully unfolded sleeves of his kurta and the suffering in his eyes that convey that they have seen and witnessed more than anyone could imagine. Bollywood’s lanky giant of both good times and bad, Sanjay’s star continues to burn brightly amidst a galaxy of stars whose fortunes have nosedived given their abject failures and consistent string of poor performances and yet, Dutt manages to take everything in his stride. 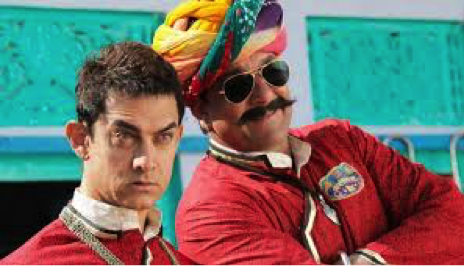 Perhaps one would agree, the odd failure of lesser imaginative ventures like Chatur Singh Two Star or that of Policegiri do little to upset the busy actor’s rhythm, the star obviously counting days to get out of the prison. Once rumored to be marrying Madhuri Dixit, Bollywood nearly got its greatest real life romantic pairing. 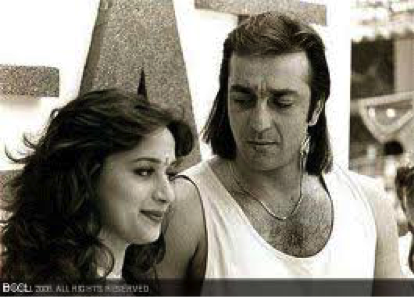 Playing an array of diverse characters marked by a genuine knack to identify the right script that does justice to his meat of acting and intellectual caliber, while the Sanjay Dutt on one hand romanced Pooja Bhatt in the highly acclaimed Sadak, he continued to be the charming heart-throb of Madhuri in Saajan. It wasn’t that he would always play the bad guy beating the hell out of the good cop but the intensity with which Sanjay echoed the triumph of the hero and the pain of the villain made for charming adulation, which he has so justly deserved. He was quick to reinvent his career, making way for a younger legion of actors like Hrithik and Shahid Kapoor by taking up the mantle of an elder character, a mature maverick of sorts. 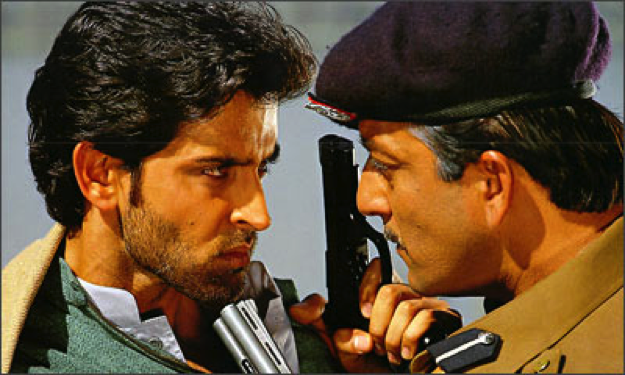 In Mission Kashmir, he was literally the fatherly figure for Bollywood heartthrob Hrithik Roshan’s Altaaf and he played the late funny uncle of Shahid in Vaah! Life Ho To Aisi. And despite taking on the softer role conveying a calming embrace through his acting repertoire, Dutt continued to essay parts that came a bit more naturally to his personality. In films like Vaastav, Kaante, Deewar and Musafir he was the stylish goon, the narcissistic and yet relatable baddie often nearing doing an act of good and still downsizing it completely. 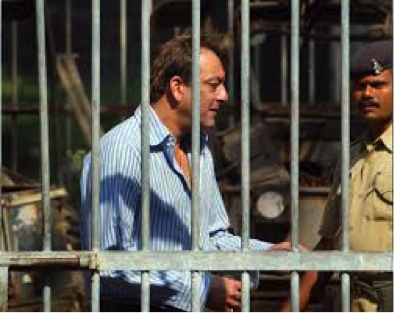 There are many Sanjay Dutt films that deserve to be dubbed as modern day classics of Indian cinema, if we allow ourselves to be vain without feeling any guilt for it. An actor of immense potential, often offering a glimpse of his personal torment to his cinematic portrayals, Dutt’s film capture the tragedy and triumph of being who he essentially is, in real life. 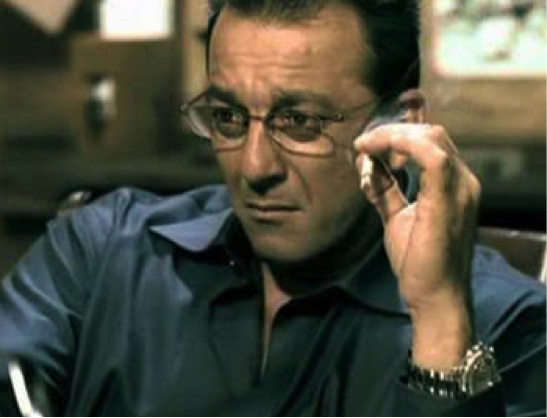 It is almost an effortless parody to see Dutt’s character refusing alcohol or that occasional smoke on the screen or resorting to tears to convey suffering instead of smashing a glass of whiskey on the floor, for the actor’s legendary dependence on both liquor and substance abuse made him nearly the anti-hero that he could have easily become, had his brilliant and larger than life portrayals like Munnabhai MBBS and the recent PK had not happened. Still serving a third term in Pune’s Yerevada prison, our actor for all seasons is quite a somber figure, languishing in isolation, having rightly been made to pay the price of a mistake he carelessly did in those years of hedonistic living. 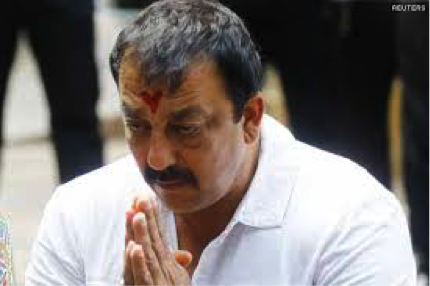 The Bombay High Court’s ruling under TADA required Sanjay to be behind bars for being in possession of arms during the most controversial time in the city’s history: the Bombay blasts of 1993. 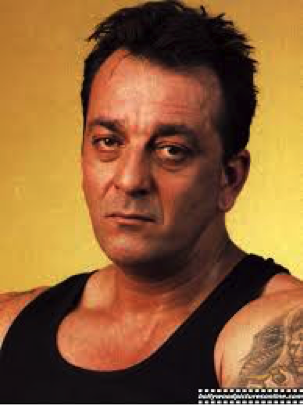 Right before he was sentenced for his final current term at the end of which he will be adjudged free, Dutt broke down in front of the media at his house and claimed immense love for his fans, family and the country and its legal system. After leading a glitzy light amidst heavy fanfare, Dutt, the family man now has sobered down into a sensitive and caring individual which is a vast difference from the iconic muscled rebel years of the 90s. Those who care to look beyond the veil of cinema and attempt to appreciate just how tough it is for a huge star of his stature to lead a normal life will finally understand that for once our man Sanjay Dutt isn’t acting and is still very capable of blurring boundaries between the real and surreal with the very gesture of warmth with which he extends a brotherly hug to Aamir Khan in PK. Rest assured, there are still miles to go for this grand actor of Indian cinema.